THIS REVIEW IS NOT A SUMMARY BUT DETAILS ABOUT THE FILM ARE DISCUSSED. 1. Abject social degeneration which forces those who still believe in “the good” to grapple with their own alienation. 2. A tragic protagonist who must delve into the dark side to bring light back to the world – to the detriment of his own happiness. 3. Low-key lighting, and droll dialogue rife with double-entendre and life philosophies. 4. Gangster/criminal/seedy character (with a troubled past, perhaps even sympathetic) who corrupts a dark, claustrophobic cityscape. 5. Femme fatale character, with varying degrees of self-reliance and/or sexual magnetism. Christopher Nolan‘s latest installment of the Batman saga, The Dark Knight, employs all of these with a new, modern layer. Since we left him standing in the embers of Wayne Manor at the end of Batman Begins, Bruce Wayne/Batman (Christian Bale) has had relative success cleaning up the streets of Gotham. He now has the backing of hard-nosed D.A. Harvey Dent (Aaron Eckhart) and the under-the-table trust of Lieutenant Gordon (Gary Oldman). The criminal element is finding it harder to do business and they are forced to take bigger risks and seek the help of others. 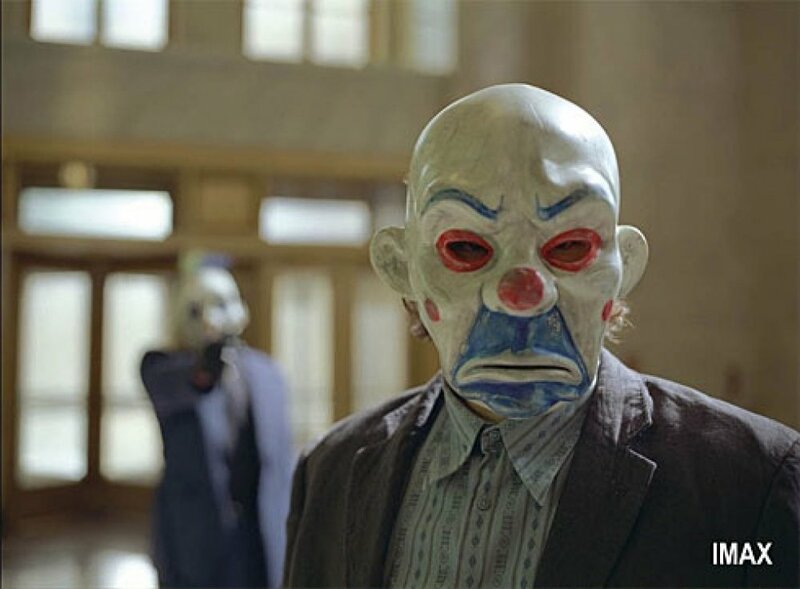 Gotham’s most heavyweight crime bosses find themselves in cahoots with The Joker (Heath Ledger), someone just crazy enough to get the job done. So, Points #1 & 2. This gets moved forward to the 21st century by the fact that the social degeneration has been contained, albeit concentrated, into Batman’s arch-nemesis. And it seems that that Joker is targeting Batman alone, by threatening those he cares about. Batman is forced to see himself as apart from the public (and apart from Bruce Wayne) and try to determine whether he should hang up his bat-cape and let Dent continue the work above-board. In the end, Batman/Wayne gives up reputation and happiness for the betterment of Gotham. #3. It is nearly always nighttime when the characters are outside. The only daytime exterior scene is an overcast afternoon. Otherwise, it is inside with few windows or it is outside at night, lit by street lamps, apartment windows, and the bat signal. Characters make witty remarks and deep observations. The Joker’s entrance scene features such a line (“Would you like to see a magic trick?”) – ironic and disingenuous. Lucius Fox (Morgan Freeman) and Alfred (Michael Caine) are ever the voices of reason, levity and wisdom. #4. In this episode, The Joker is the villain of the hour but he is complimented by a crew of unsavory characters – both in henchmen and cohorts. They are like-minded ne’er-do-wells that are inspired by the Joker’s ability to get things done. And Joker’s stories of mutilation are tragic. Even if they cannot be believed, for moment, the hearer feels sorry – horrified that a human could go so low. After all, that is the heart and soul of Gotham’s struggle. Gotham City itself is represented by Chicago, used for its Art Deco architecture – angular, linear, chrome, glass, steel. Cold. There is no softness, or comfort here. #5. This femme fatale would normally be someone like Catwoman but she is not present in The Dark Knight. It might seem then that the task is left to A.D.A Rachel Dawes (Maggie Gyllenhaal), as the only major female character in the film. She does display a few of the traits. She is quite beautiful. She is sassy, with a mind of her own. She is the object of affection for more than one man and her association with them puts her in harm’s way. But, unlike the femme fatale, she does not use her influence to affect the hero. Not on purpose, anyway. Instead, the Joker picks up many of the negative characteristics of the femme fatale. He goads Batman, forces his hand and gets under his skin. He manipulates people by finding their weaknesses, by poking and twisting. He hides behind makeup and costuming. He does it all in style, with something that keeps you from looking away. Nolan pushes this fatale type even further by putting The Joker in woman’s clothing for the scene in which he pushes the pure, chaste hero to the other side. Exactly the job for the femme fatale. This telling of the Batman tale is extraordinary. All these fantastical themes, characters and situations are made entirely plausible. It is taken seriously, and from there the filmmakers stitch it into a flashing reality that resembles our own. The very object of film noir. 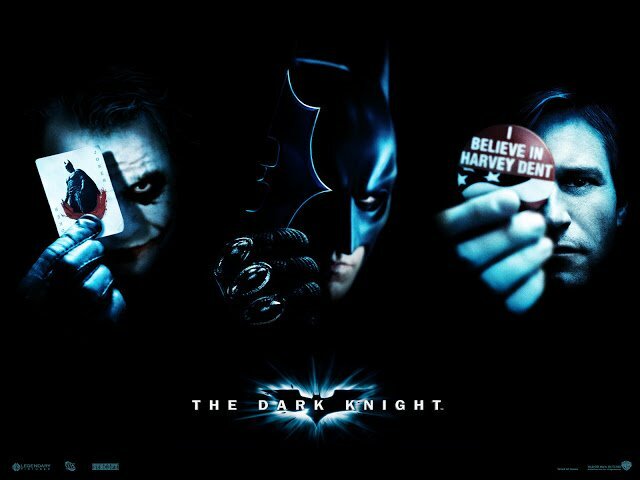 The Dark Knight is well-done all around. The acting is superb – from everyone. It was great to see the drab Katie Holmes replaced with the extremely talented Maggie Gyllenhaal, although she is not really given a chance to show her acting chops. As expected Heath Ledger is brilliant as the Joker. He absolutely created a unique character that will be impossible to replace. Any attempt will only seem to be an impression. No complaints here. A thoroughly enjoyable and finely crafted film. Eee! I can't wait to see it. Love the noir comparisons. I'm sure my review would have been like "Uh…Christian Bale is really hot.."